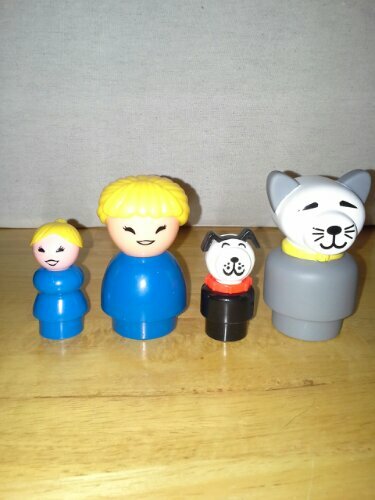 My Mom recently bought my kids some of the new Little People, and I think it is hilarious to compare them to the Little People that I had as a kid. I am glad the lady lost her hour glass shape and now sports an A-line number. The pet dog somehow became a cat that is a big as it’s owner. Hmmm maybe that will happen to our cat Sumo (after gaining 13oz last year). Little People look what happened to you! My kids still play with the small, retro Little People since they don’t really put stuff in their mouths. We have the house and school / playground out right now. Do you have any original Little People from your childhood?